Smart Clip is the universal cell phone clip that will always keep your phone handy. This ingenious cell phone holder lets you easily reach your cell phone. Use it on your pant loop, handbag, gym bag, backpack, beach bag, diaper bag, and more. 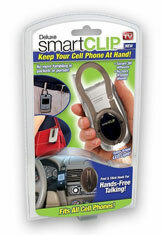 Smart Clip will fiton any cell phone, PDA, iPod, and camera. It won’t slip off so your item is always safe and ready to use. The Smart Clip is durable and secure. Just peel and stick. The adhesive is strong enough to hold up to 8 pounds. When you want to remove the Smart Clip just use the easy release notch and it comes right off. Plus the Smart Clip has a built in LED light that is convenient for help you see in the dark. When you purchase a Smart Clip for $10 plus shipping and handling, you’ll also get a Peel & Stick Hook. But that’s not all. With this current buy 1 get 1 free offer you’ll get a second pair of Smart Clip and Peel & Stick Hook free. That’s 2 Smart Clips and 2 Peel & Stick Hooks for just $10 plus shipping and handling. One Comment on "Smart Clip"